There are two Democrats on the ballot for state assembly on April 19 — though one of them is on the Working Families line — so there’s been some intrigue around endorsements. 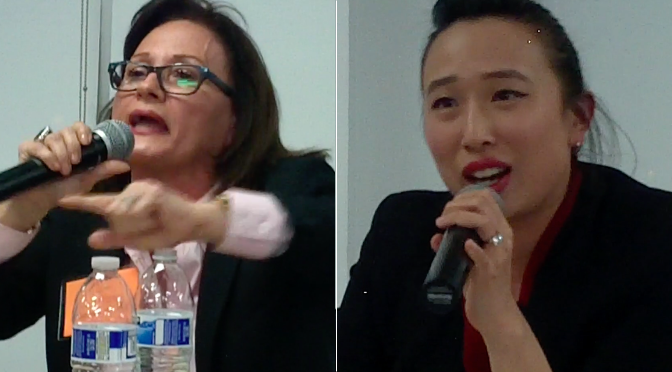 At our candidates forum last week, Working Families Party candidate Yuh-Line Niou announced endorsements from prominent establishment Democrats in the Bronx and Queens, seemingly highlighting her opponent’s criticism that she’s parachuting in from outer boroughs with no LES street cred of her own. Since then, Niou has picked up more local endorsements, from our State Senator Daniel Squadron and neighboring Assemblyman Brian Kavanagh. Despite being the official Democratic candidate, Alice Cancel has had a hard time picking up endorsements from Democratic elected officials. (Even her current boss, Comptroller Scott Stringer, has endorsed Niou, which Cancel called a “back-room deal.”) But this week councilwoman Rosie Mendez, a Cancel backer from the start, persuaded her colleague Margaret Chin to join her in endorsing Cancel. But there’s a catch: Chin supports community board 3 chair Gigi Li, who is already running for this seat for the September primary. So Chin’s endorsement lasts only until April 19; after that, even if Cancel wins, Chin says she’ll support Li.